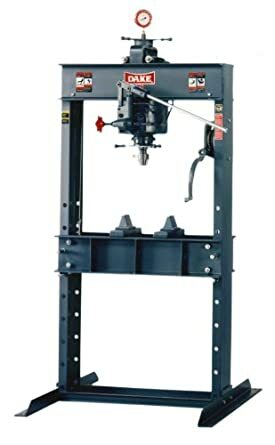 The Dake 25H hand-operated H-frame hydraulic press applies up to 25 tons of force to facilitate pressing and forming. The channel iron H-frame accepts large and bulky items, and the hoist adjusts the table height for proper positioning and automatically locks in place. The handwheel advances the ram for quick placement near the object being pressed. The handpump lowers the ram onto the object with more precision and control than the handwheel. The release valve turns to release the hydraulic pressure, initiating rapid ram return after downstroke. Closing the valve at any point during the ram return will halt the ram. The press has a gauge with 4″-dia. display for pressure readings. It also includes two combination table plates/V-blocks that can be used to support or hold an item in place while pressing, and a flat nose for the ram. Four 17/32″-dia. holes are located on the base to enable bench mounting. Mounting hardware is not included. Hydraulic oil is not included. Press is assembled. H is height, the vertical distance from the lowest to highest point of the press; W is width, the horizontal distance from left to right; L is length, the horizontal distance from front to back. Hydraulic presses use fluid pressure to transmit a compressive force, which stays constant throughout the length of the ram’s stroke. Metal forming is one common use of a hydraulic press.